Mai Life Magazine publisher Naziah Ali and mother Sereana Mataka. Roy Krishna and Naziah Ali put their own unique spin on Fijian weddings this week as they started their four-day mixed cultures wedding. From their mixed cultural wedding to the secret locale, the couple broke away from all kinds of wedding traditions. 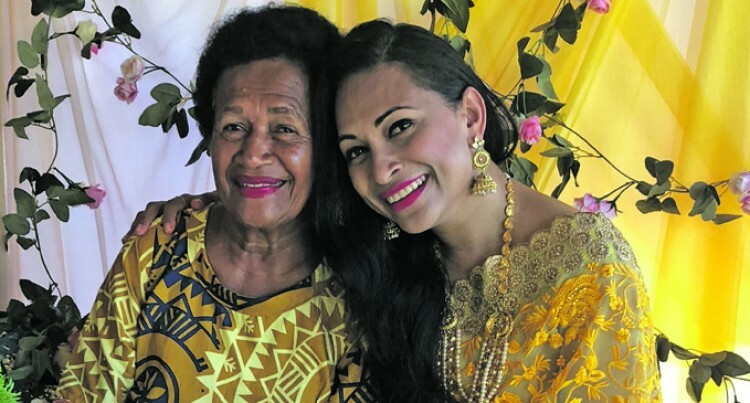 Fijian football star Roy Krishna and Mai Life Magazine publisher Naziah Ali’s wedding celebrations kicked off yesterday with the two having their separate haldi ceremonies. Krishna has his haldi ceremony and prayers at the Sri Mariamman Temple in Lautoka while Ali opted to have hers at the Ali residence with close family in Ba. A haldi is a traditional Hindu ceremony usually organised a few days before the wedding. Tumeric paste is smeared on the body by the women in the family. The paste serves as a cleanser for the body and signifies the preparation and welcoming into married life. The couple will have their tevutevu ceremony today with the extended iTaukei family on both sides bringing traditional gifts for the couple followed by a series of traditional rituals. The couple will dress in traditional masi made by the women of Lau. Their mats are also by the women of Komo in Lau. Mr Krishna and Ms Ali have iTaukei links. Mr Krishna’s grandmother is from Labasa and Ms Ali’s mother is from Nailaga Village in Ba. A joint mehendi ceremony is scheduled for Saturday in Ba. Ms Ali is wearing bridal wear by local designer Zulfikar Ali, AZA for the daytime mehendi ceremony. At the joint mehendi ceremony she is wearing an Indian gown made of Swarovski crystals from Hyderabad with Kundan jewellery sourced by Zulfikar Ali from India. The white wedding ceremony will be held at a secret location followed by the reception on Sunday. Ms Ali is wearing a custom made white gown from a Turkish artelier. The secret ceremony is at an undisclosed outdoor venue. The three-tier wedding cake is custom made by Patisserie Pasifika chef Saeri. The couple have opted for a mix of flavours for their wedding cake instead of a traditional fruit cake. The cake is decorated in white pearls and pastel flowers to tie in with the floral theme of the wedding. The hair and make-up is done by Totoka Hair and beauty led my local make-up artist Lydia Whippy for Ms Ali and her nine bridesmaids. Local groups including VOU, Masti dance group, Pasifika Voices and Laisa Vulakoro are expected line ups for the four day event with reknown light and sound engineer DJ Skitz, Prashant Anuraj, closing each event. Overseas and out of town guests have arrived in the country as the festivities began for the wedding.